Provide comfort for the family of Eleanor Selby with a meaningful gesture of sympathy. 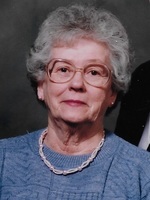 Eleanor Agnes (O’Connor) Selby was born in St. Paul, Minnesota on July 5, 1923 and passed peacefully at home on March 21, 2019 following a bout of pneumonia. Eleanor was born at home which coincidentally was on Selby Avenue in St. Paul. She was 95 at the time of her passing. Eleanor will be greatly missed but never forgotten. Eleanor was raised in St. Paul along with two brothers and two sisters. After graduation, and after working in California for her uncle for a few years, she joined the Navy on July 11, 1944. She served mostly in Washington, DC as a stenographer and was honorably discharged as a Yeoman, Second Class, on May 4, 1946. After leaving the service, Eleanor headed to Colorado to visit her sister before returning home to St. Paul. But on an ordinary Saturday night dance at the local community center, she met her future husband, Bob Selby, who lived in the same area as her sister. Romance began that night and by the next day both knew that they had found the person they would marry. They married 6 months later on November 20, 1946 in Brush, Colorado. Bob had a dream that his children would all be born in different states. Thus began a period of wandering. First - Kremmling, Colorado where Bob was born; then Garden City, Kansas where Bill was born; then Butler, Missouri where Lori was born. Circumstances brought them back to Johnstown, Colorado where Ron was born. Eleanor has lived on the farm since November 1954. She was a stay-at-home mom whose later years were filled with spending time with her children, grandchildren and great-grandchildren. For many years she was a regular at both the Milliken and Johnstown Senior Centers. Eleanor was preceded in death by her husband Robert F. Selby. She is survived by her children Robert C. Selby of Windsor, CO; William H. (and Becky Lynn) Selby of Milliken, CO; Lori L. Selby of Fort Collins, CO; and Ronald J. (and Becky Ann) Selby of Johnstown, CO. Bill’s children are C. Todd (and Erin) Selby of Milliken, CO and Joseph W. (and Rachael) Selby of Anchorage, AK (and their children Ireland G. Selby & Archer T. Selby). Lori’s children are Adam R. (and Sarah) Selby (and their children Alexander Q. Selby, Arianna R. Selby & Haley D. Selby) and Steven C. (and Erica) Selby (and their children Liam C. Selby & Haddie A. Selby). Ron’s children are William E. Selby and Marcus J. Selby and step-daughters Natasha Tiff and Cheyenne L. Smith. She is also survived by sisters-in-law Alice O’Connor, Marjorie Jacobs and June Haller and her brother-in-law Raymond Haller. She was preceded in death by her parents Harry & Elva O’Connor, her sisters Leona Rosenberger and Mary Queen, brothers Bernard (Jim) and Timothy (Tom) O’Connor; sisters-in-law Lucille Gall, Lucille O’Connor and Betty Morman; brothers-in-law John Rosenberger, Burton Queen, Roger Selby, Arthur Morman and Gene Jacobs. No services are planned at this time. Memorial contributions may be made to the Johnstown or Milliken Senior Center in care of Adamson, 2000 47th Ave., Greeley, CO 80634. Friends may leave condolences at AdamsonCares.com.